2683 ACRES TERRELL CO. HUNTING RIVER RANCH!!! 331 ACRES ERATH CO. GREAT HUNTING PLACE!!! 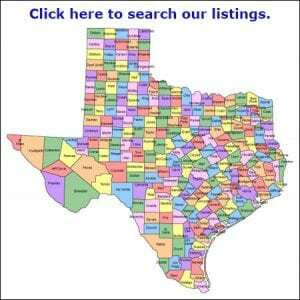 TexasLandHunt.com is poised to be the largest and most complete rural listing service for Texas land. No ads to distract from your hunt for Texas land, just uninterrupted listings. Whether you’re looking for a couple of acres on the outskirts of town or a 10,000-acre spread in the wilderness areas of Texas, Texas Land Hunt can help with whatever you’re looking for. We specialize in farms, ranches, mountain property, lake houses, river homes, beachfront homes, and country homes all across Texas. Texas has more farms and ranches and the highest acreage of farm and ranch land in the country. Being in one of the most varied regions of the United States, our properties have many diverse uses. Our listings typically include recreational amenities like hunting, fishing, camping, backpacking, horseback riding, and four wheeling. If you’re more interested in agriculture, we also feature properties which provide grazing land, gardening space, vineyards, cropland, equine facilities, and various types of livestock operations. An occasional rural bed and breakfast and wedding venue have also found their way into our Texas Land Listings. Realtors, Agents, and Brokers may register to list properties by clicking on the link below. No 3rd party advertising on Texas Land Hunt, EVER!